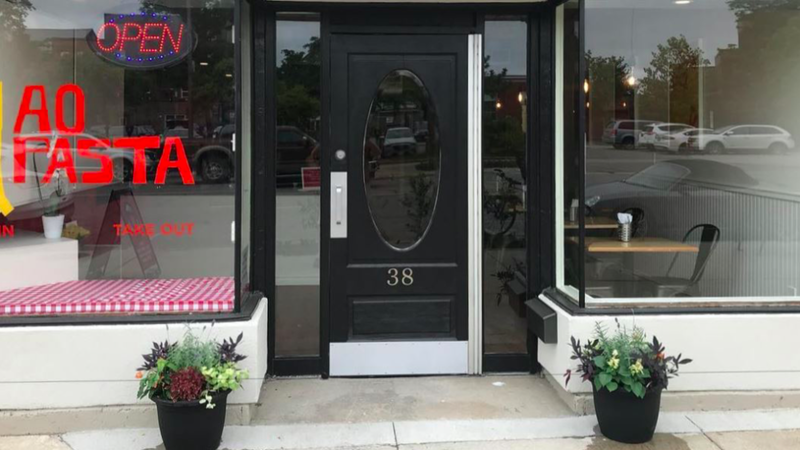 AO Pasta, opened June 2018, is a casual, family-friendly, counter service Italian restaurant located in the heart of downtown Stratford. We offer a simple and honest, Italian-inspired menu anchored by our pastas and made-to-order sauces. Our menu is complemented by seasonal dishes, salads, and our signature “Arancini”, deep-fried risotto balls stuffed with mozzarella. AO Pasta is owned by Chef Kris Schlotzhauer, a Stratford native, and Pastry Chef Suzy Schlotzhauer, from Calgary, AB. The two met while working in together in Calgary, before moving across the country to Toronto where they worked in some of the city's best restaurants. They moved back to Stratford to raise their young family and follow their dreams of opening their own restaurant. AO Pasta, (named after their two kids, Axel and Olive) is that dream, and they can't wait to share it with their guests. Cave Spring Pinot Noir "Dolomite"
“When Kris Schlotzhauer and wife Suzy opened a new restaurant in downtown Stratford near the city’s busiest intersection last week, their goal was to foster a casual, informal setting. “It’s a first-come first-served seating system with no reservations, and there’s minimal staff. But it works.